Located in the heart of Maple Ridge, Woodopolis Home Centre is your destination for anything flooring, bathroom or kitchen. We stock a large assortment of hardwood, laminate, vinyl flooring and a great selection of flooring tile, bathroom tile and kitchen tile including backsplashes. 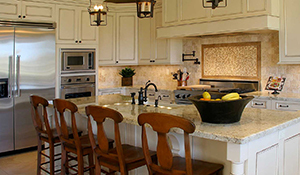 For those not so adventurous, our professional installation and renovation team is available to design and build the dream kitchen or bathroom you’ve always wanted. Our experienced designers and installers can help you from picking colour schemes and floor samples to dusting off the final renovation. Our installation and renovation team is fully insured and bonded and they have the experience to tackle any home remodelling job, not just your bathroom or kitchen. Call us or come into our Maple Ridge showroom and ask us about how we can help make your house your home.